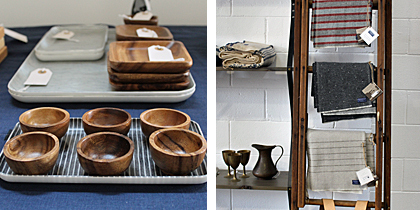 Alchemy Works, a sporty saltwater boutique now open in an Arts District warehouse. Brought to you from one-half of the heritage do-gooders at Apolis, this colossal space is fronted by roll-up doors that, once opened, reveal a 1959 Fiat Abarth 750 Spider (only $78k!). 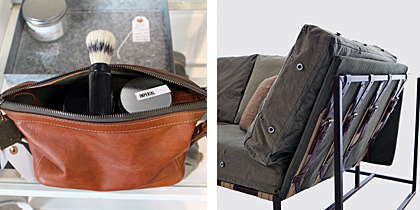 Steven Kenn’s furniture set made from World War II fatigues is perfect for your back porch, and his handsome leather bags are ideal for those upcoming holiday getaways. 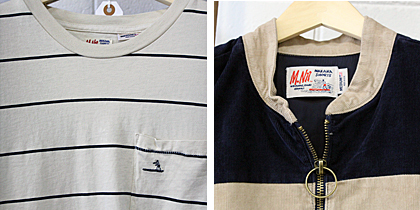 M.Nii striped tees and natural toned sweaters and jackets — dressy enough for family reunions, sporty enough for tossing the pigskin. Faribault woolen blankets (so soft you’ll doubt it’s wool) and Fog Linen Works linen plates and wooden tableware (so snazzy you’ll leave ’em out even when they’re not in use).